Call of Juarez: Bound in Blood has the dubious honor of being the first game in years that I have accused of cheating. As I restarted one of the showdowns for the fifth time, I began thinking about why my thoughts had turned to foul play for this game in particular. I am no stranger to the "game over" screen (Damn you, Hatsworth! ), but something about these showdown sequences convinced me that the AI was stacking the deck. After banishing the game from my house and reading this enlightening article from Soren Johnson, I have decided that the showdowns in Call of Juarez present the player with the perfect storm of frustrations: on thematic,gameplay dynamic, and mechanical levels, they work to frustrate the player and set the AI up to be seen as a cheater. Game Thematics: "Clint Eastwood Always Shot First"
As Nels points out, the history of Western storytelling has instilled the assumption that the protagonist will come out on top. The fight might swing back and forth and the things will get tense, but the audience knows who will walk away when the dust settles. Techland did an excellent job of conveying the feel of the filmic Western, perhaps too well: by introducing the possibility and the reality of the protagonist's failure, the game stands in opposition of well-established cultural expectations. As a fan of Westerns, the idea that the protagonist must win the showdown is almost axiomatic. Thus, any subversion of this iron law must point to subversion on the part of the AI. I fully admit this is my fault, and that it probably is not fair to let my past experiences color my perceptions of the game. However, as Johnson says "with cheating, perception becomes reality." And besides, as Clint said, "Fair's got nothing to do with it." See? Even when his gun misfires he still shoots first! Most of the gameplay in Call of Juarez follows the model popularized by games like Halo and Gears of War. While the player is outnumbered by enemies, the AI controlled characters can take less damage and tend to shoot less accurately during the fights. Combined with plentiful ammo and regenerating health, these mechanics reward risky behavior. The showdowns stand in sharp contrast to other sections of the game, as the player is suddenly as vulnerable as the AI, precise timing is mandatory, and a lack of cover and regenerating health provide no second chances. While the majority of the game is asymmetrical (in that the AI and player have different goals and abilities), in key moments it becomes symmetrical (in that the AI and player have the same goal and abilities). Johnson comments that it is "especially challenging for designers of symmetrical games" to create fair fights. If the player can overcome the AI too easily, there is no challenge, but if the AI seems to possess unseen advantages, the player begins to suspect cheating. In the case of Call of Juarez, the juxtaposition between asymmetrical and symmetrical gameplay styles was jarring enough to precipitate thoughts of cheating. While it is fun to rag on IGN, I have to agree with their assessment of Call of Juarez's showdowns: "Beware; the opponent cheats by always having 100-percent accuracy." Even if I managed to draw quickly enough, I would often miss the mark and eat the AI's lead. Curiously, the AI never fumbled with the draw, nor shot wide of the mark, leading me to believe that, in a situation that should be a relatively fair fight, the AI has an unfair advantage. In the original Civ, the AI was hard-wired to declare war on the human if the player was leading the game by 1900AD. This strategy felt unfair to players – who felt that the AI was ganging up on the human – even though most of them would have followed the same strategy without a second thought in a multiplayer game. The key here is that only "most" players would use the same strategy as the AI. Humans are notoriously illogical and individualistic, which leads to both unconventional strategies and random mistakes. 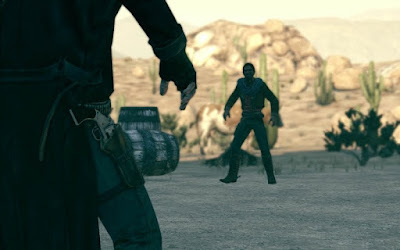 Without building in some sort of capacity for error, the enemies in Call of Juarez gain unique advantages over the player. The signal to draw is the sound of a bell in the sound track, and while the chime takes place at a set point, a myriad of factors can still lead the player to make a mistake. Even if the player remembers (or correctly guesses) when the bell will sound, they must still must circle the AI opponent to maintain a clear target with the left thumbstick, keep the character's independently movable hand close to the gun with the right thumbstick , and pull the trigger at the correct time after drawing. Add to this the many biological annoyances gamers face, such as sneezing, blinking, and sweating, and the idea that your opponent will draw, aim, and kill reliably becomes exasperating. How could the duels in Call of Juarez been improved? One route would be to give the player more tools towards victory. Perhaps a force feedback system with various levels of vibration that signaled the right time to draw? While it would detract from the game's visually immersive capacity, an aiming meter akin to the ones used for punt controls in the Madden games would have given players a visual representation of their accuracy. Imagine a situation in which the player must manually stop the aiming meter at the correct point to make an accurate shot. At first, the meter would swing back and forth rapidly, but it would eventually slow as the time to draw neared. This system would also give players the option of choosing to risk taking an early, but possibly less accurate shot. However, these solutions might have proved too contrived for the feel of the game. The solution then comes back to cheating. As Johnson concludes, if games must cheat, they should do so "only in favor of the player." If Techland was looking to make a celluloid western in digital form, preserving the feelings of power and control exuded by Western heroes may have justified a hobbled AI. Having to retry a gun battle ten times would have never happened to the The Man With No Name, so it should never have happened to me. And if that makes me a cheater, so be it. Or at least have an AI that progressively gets "dumber" each try, or the option to switch difficulty levels. Shamus over at Twenty Sided has written about this more than once. I wrote about it obliquely in my "Game Tourism" article. I think it was Lum over at Broken Toys (echoing others, I'm certain) that noted that players don't really want "fair" fights. They want to win. This is what makes PvP in MMOs so difficult to tune for (it's not the mechanics, it's the player expectation that is hard to tune). If we wanted "fair", we probably wouldn't be playing games in the first place. I think we want to be challenged then overcome those challenges. Winning against all odds is exhilarating, losing at the last second, or losing to what is perceived as a cheating AI is extremely frustrating. I remember trying to complete some of the harder challenges in the N64's Golden Eye, and deciding I was being cheated. I know, I know. All gamers say the game cheats, but Golden Eye really did by not having the NPC Mobs play by or have to adhere to the same rules as the player, especially on harder levels. In Golden Eye, when the player got shot it affected their accuracy and rate of fire. IIRC (it's been a long time since I played) your crosshair was moved and you were unable to fire a retaliatory shot for a very brief period of time. And if you got shot in the head the effect was enhanced. The AI in Golden Eye cheated by not applying these same rules to the NPCs Mobs, which made completing some of the Expert challenges insanely difficult because the Mobs could take more damage. This meant some enemies could take 3-4 shots to the head while returning very accurate fire that often felled you after 1-2 shots to the head. When you encountered multiple opponents and they began shooting back, and their hits on you interrupted your rate of fire while your shooting them did nothing to them, it felt very cheap. We want a challenge, we want to be challenged...then we want to win. I also don't think we mind losing too much as long as we can perceive that victory is just around the bend. As Tesh said, "fair" in terms of gaming seems to actually mean "skewed in favor of the player." Trying to let the player eat and have their cake must be incredibly frustrating to developers. It's funny you bring up Goldeneye, Cap'n John, as I was thinking about its place in terms of the FPS genre just recently. I played the hell out of that game and remember quite vividly how hard the enemies got on "007 mode" (or whatever the hardest setting was). Viewed with today's sensibilities, it took a very old school approach to difficulty: make enemies stronger and the player weaker; none of this new-fangled "AI director" stuff!